During my time at DRIVETRIBE I primarily worked on a feature called MyGarage which allows people to upload a complete history of their vehicle ownership as well as their dream vehicle and any vehicles they have for sale. Each vehicle upload consists of an image, make and model. Optionally a user can add the model year, year of purchase and a text description. Uploaded vehicles can be liked and shared by other users, and they can comment to ask questions or provide opinions. The makes and models can be from a list of known brands or a user can input a custom value if they have something particularly rare. The feature has two main benefits, one being that users enjoy the feature and spend a lot more time on the website if they can interact with their own garage and comment and share other peoples. Secondly, DT gets access to a wealth of data about its users; such as how often they get a new vehicle and what they would really like to buy in the future. I worked on the front-end portion of the feature on DTs responsive website such that it worked both on mobile and desktop browsers. The front-end was written in React and utilised the very cool Styled-Components library, which I enjoyed using. One of the most exciting parts of working on this project was that it was announced to the world by James May of Top Gear and The Grand Tour fame. A competition was also ran where a user could win (a model of) their dream ride and the winner was announced by Richard Hammond. I hope a lot of people get a lot of enjoyment from this neat feature. I was invited to talk at Tech Days Online at the Microsoft Reactor in London today on the topic of Microservices. Rather than a presentation format the talk was as part of a conversation moderated by Christina Warren, Senior Cloud Dev Advocate for Microsoft. Being live on Channel 9 — Microsofts online TV channel — was somewhat nerve racking but I think it went quite well and I enjoyed the format. Thank you to everyone involved in the production, I had a lot of fun! I was planning to do some more solo circuits on Sunday, however in the end I got to do something even more fun! Instructor Bill rang me in the morning to ask if I would like to go to the flight school earlier and share a navigation exercise with fellow aviation student Terese. Of course I wanted to! The plan was for Terese to fly the outbound leg and for me to fly back. I was somewhat nervous as I hadn’t done any navigation before and had only watched a few videos online about the basic concepts, but felt better as I would get to see navigation skills in action before having to use my own. The method of navigation you use for flying under visual flight rules is called Dead Reckoning. In simple terms dead reckoning is using speed and heading to determine where you currently are in relation to a previous known landmark. Therefore, the first thing you need to do to create yourself a route is find landmarks that will be easily visible from the air and ensure that the route between them will not pass over any restricted airspace or gliding activity. When I arrived at the Mid Anglia School of Flying briefing room Terese and Bill had already selected a route to get to our destination of Turweston from Cambridge. Now that a route was selected the three of us worked together to determine the track headings, which you can think of as compass headings, that we would follow at various stages of the flight. We then made adjustments for magnetic changes across the route and forecasted wind. Using the heading, distance and weather information we had acquired we could work out the estimated time between each landmark we would see enroute. 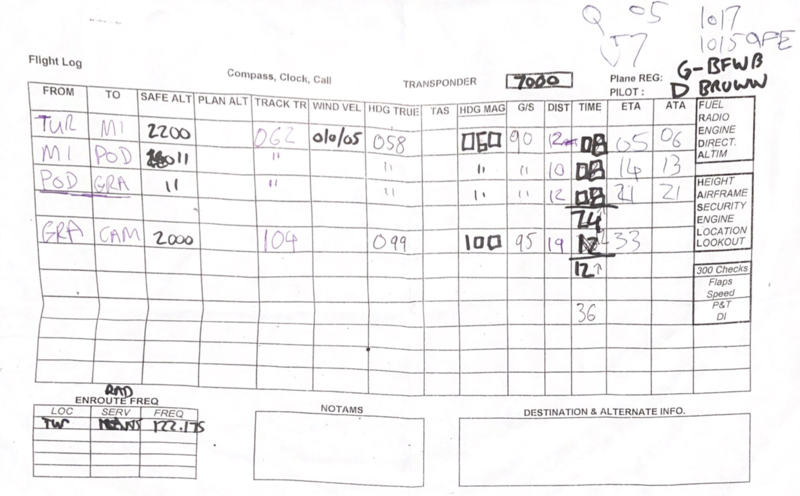 All of this was noted down on a document called a flight log. As it was my first time doing it, and Terese is also fairly green, filling in our Flight Log took almost as long as the flight was planned to! But time spent planning is always worth while, much better than spending time and fuel going in the wrong direction — or worse. On the outbound trip I was sat in the back of G-BFWB. I hadn’t sat in the back of a PA-28 before, but even at 6ft 3 I was pleasantly surprised by the leg room! 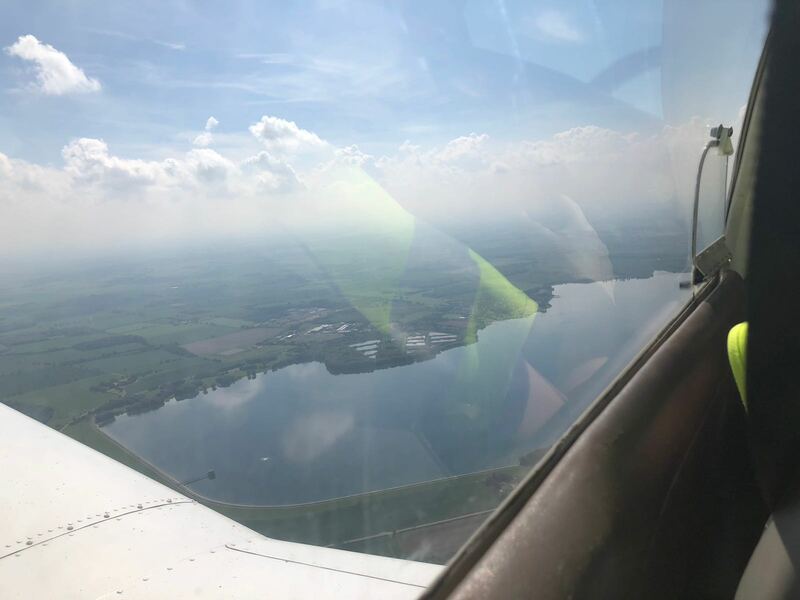 As Terese got to grips with the ultimate multi-tasking challenge of flying a plane whilst looking for landmarks and filling in actual arrival times on the Flight Log I was able to enjoy looking out the window at some familiar places, including; Grafham Water Water, Milton Keynes, Northampton and the Silverstone Formula 1 track. When we arrived at Turweston I was pleasantly surprised by the airport! I’m not sure what I was expecting but I certainly didn’t expect it to be a flash as it was. It certainly helps that it is the closest airfield to Silverstone for the Gran Prix fans who arrive in their private jets and helicopters. The staff at Turweston were also great! The gentleman with whom we had booked out came to meet us at the plane and took the photo of the three of us which is at the top of this post. In order to pay our £15 landing fee we had to go to the Control Tower, which I was quite excited about! Turweston as a small airport which exclusively caters to General Aviation doesn’t have a full Air Traffic Control service that big commercial airports such as Heathrow might have, but instead has a “Radio” service which is a little more casual and can only advise aircraft what to do, rather than tell them and provide clearances. For a bit of fun we rated some of the landings coming into the airfield, with ATC providing scores to the pilots themselves. Before leaving I told the controller on duty I would be flying out and apologised in advance 😉. 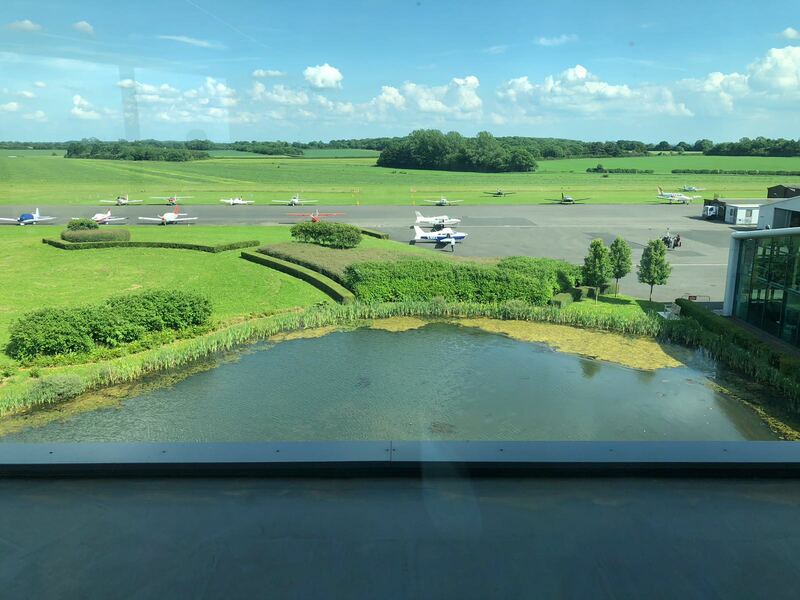 Having been spoilt by Cambridge Airports 1965m runway Turweston felt comparatively short at 1000m, though clearly more than enough to take off in a PA-28. Flying back I realised the sheer amount of work involved when thinking about navigating as well as aviating as someone so new to both. At one point I even told ATC I was heading “west” for Cambridge, despite the lack of fuel or onboard toilet facilities required to circumnavigate the globe. Despite the amount of thought required it was however terrific fun and a bit of a rush when I was overhead the M1, my first landmark, enroute and only a minute behind my estimated time of arrival! 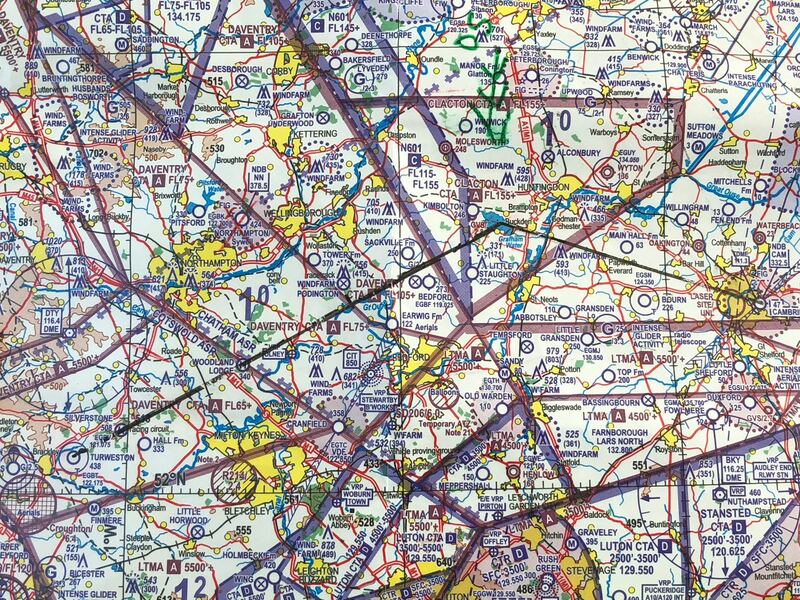 After that I was looking out for Podington Wind Farms and then Grafham Water where I changed course to get to Cambridge Airport (all detailed in the aforementioned Pilot Log). When I got to Cambridge I got into the circuit through a standard overhead join and Terese captured my landing on video. Thanks to Terese and Bill for a great day of flying! 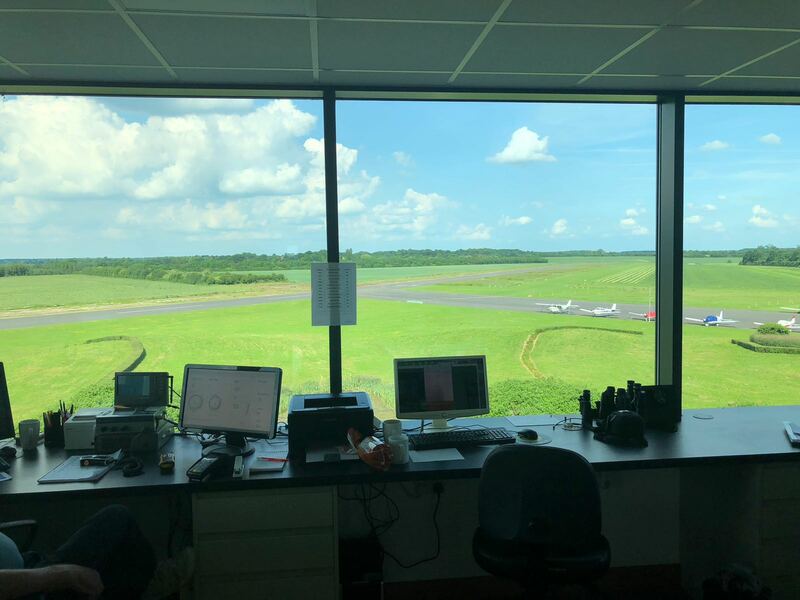 We all agreed we would do it again as it is helpful for Terese and I to watch each other learn, and it means we can go farther-a-field to new and exciting airports like Turweston. Hopefully next time we shall arrive at our destination 10 minutes before the Cafe shuts, rather than 10 minutes after! In my blog post about DevOps I argued that a good Software Engineer knows not only about his code, but about how and where it is going to be ran. In the past I have been guilty of having an idea which service I might use to run a particular application (usually Microsoft Azure as I get big discounts as a former MSP) but not having had a full idea of the exact environment said application will execute in. Recently I have been treating infrastructure as a first class citizen of any project I work on using the process of code-defined infrastructure. Instead of manually provisioning servers, databases, message queues and load balancers — as you might do when using the AWS Console or cPanel on a shared webhost — I create a deployment script and some configuration files. I have actually banned myself from manually creating new instances of anything in the cloud, in order to avoid unwittingly allowing any single instance to become a Pet. If someone tears down an environment by mistake we don’t have to try and remember all of the configuration to relaunch it. We have it in code. We can easily spin up new environments for any given feature branch rather than being stuck with just “staging” and “production” environments. Infrastructure changes show up in version control. You can see when and why you started shelling out for a more expensive EC2 instance. At a glance you can see everything an application requires and the associated names. This makes it easier to be sure that when you’re deleting the unhelpfully named “app” environment it won’t affect production. Scripting anything you can imagine is a lot easier, such as culling servers with old versions of an application programatically. 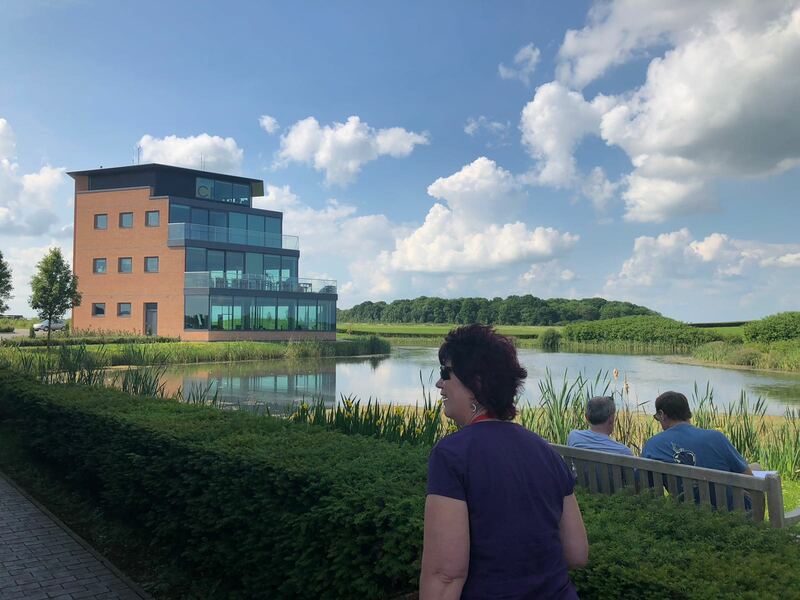 Introducing code defined infrastructure on one of our greenfield projects at PepperHQ has already paid dividends and the team has a desire to back-port the infrastructure management scripts and config files I developed to other services. I developed the system with the idea of a git commit being the true “version” of a given application and that all infrastructure associated with a given version should be totally immutable. In order to deploy a new version of our new greenfield system you don’t upgrade the application on the server, you create a whole new environment with the new version on and then delete the old one — or keep it around for a hot swapping back in the event of an issue. The infra-scripts also allow you to see what is live identified in a way useful to developers — by commit id and message. Other features include turning any environment into “production” or “staging” by updating their CNAMEs through AWS Route 53. When using the yarn terminate to kill a particular environment checks are ran to ensure you’re not deleting “production” or “staging”. The scripts are developed in TypeScript using the aws-sdk npm package. Whilst this approach does require some more up-front investment than just manually creating environments as and when you need them, I recommend any developer writing systems people will really be relying on at least investigates this approach as there is a very quick return on investment. Some more out of the box solutions you could look into are Chef and AWS CloudFormation, though I ruled out using these for Pepper based on our internal requirements. My brother posted a video to YouTube of when he came flying with me some time last year. You can watch it above. The idea of DevOps — short for developer operations — being a discrete role in Software Development doesn’t make a whole lot of sense to me. As I have had quite a few conversations about this in the past few weeks I felt it might be useful to get my thoughts written down. The original concept of DevOps as a culture of continuously automating, improving and monitoring all stages of the Software Engineering process is great, and I believe it will only become more important as businesses move toward using a whole host of micro services rather than singular monolithic systems. However, in recent years the term has been, in my opinion, bastardised to describe a new type of job role which sits somewhere between a Software Engineering generalist and a SysAdmin. What does the day-to-day responsibilities of a “DevOps Engineer” consist of? It’s somewhat hard to say because, as is usually the case in technology job titles, there is no hard-and-fast definition (What’s a code wizard again and how is that different from a code ninja?). However, in my experience and from what I have read online in job listings they usually develop and manage deployment pipelines and cloud/local hardware infrastructure as well as monitoring services and applications for errors and performance issues. I have always felt that one of the markings of a good Software Engineer is their ability to understand the entire lifecycle of their application, from developer experience at the time of initial development through to deployment and ongoing monitoring & maintenance. Looking at any one stage of the lifecycle in isolation means that easy wins are missed; for example writing code so that it is easier to maintain in the future or selecting a stack which can be bought to life quickly to enable more fine-tuned scaling. In the worst cases that I have personally witnessed developers have created a fragile, complex mesh of services and infrastructure rather than simplify and improve things knowing that it will never be them that is woken at 3am to fix it — it’ll always be the DevOps guy. In short, the most obvious issue with having DevOps as a discreet role is that it encourages, and in some cases mandates, “chucking things over the fence” — in other words solving problems by making them someone else’s. That’s no way to run an effective engineering team and means that the DevOps engineers often get the short straw. Software Engineers are in the rare and enviable position of being able to produce their own tools — most farmers can’t build their own tractors and most pilots can’t build their own planes — and are the people who know exactly what tooling and processes would enable them to work faster and smarter in their day-to-day roles. They should use this position to enhance their own productivity and build & maintain better services. One downside of requiring all engineers to understand the operations aspect of their code is that the knowledge of what tools and best practices are available needs updating frequently as the industry moves forward at an ever-faster pace, but this is true of all aspects of our jobs as Software Engineers. The correct solution is to make each engineer the master of their own destiny regarding deployment and maintenance and provide them with time to learn and develop their skills in this regard. Got some new business cards at work today. They’re pretty nice.